You will be given a reference e-book to read which has 360 pages And the test will be based on that e-book , you can take final test within 1 year of purchase. If you want to know exactly what is SAS and the many things that it can do especially in the field of programming, then you should consider enrolling in the Brainmeasures SAS certification program. The guaranteed reliability of Brainmeasures as well as its ISO certification can give you a hundred percent assurance that you will receive nothing but the best from enrolling in its offered SAS course. This online certification course aims to provide all its participants with a high level of knowledge in the field of Statistical Analysis System (SAS) by making sure that they continuously receive a comprehensive and detailed SAS training until the end of the program. With the help of the SAS certification course from Brainmeasures, you will become more familiar about all the features installed in the software as well as the many benefits that it can offer especially when it comes to programming. 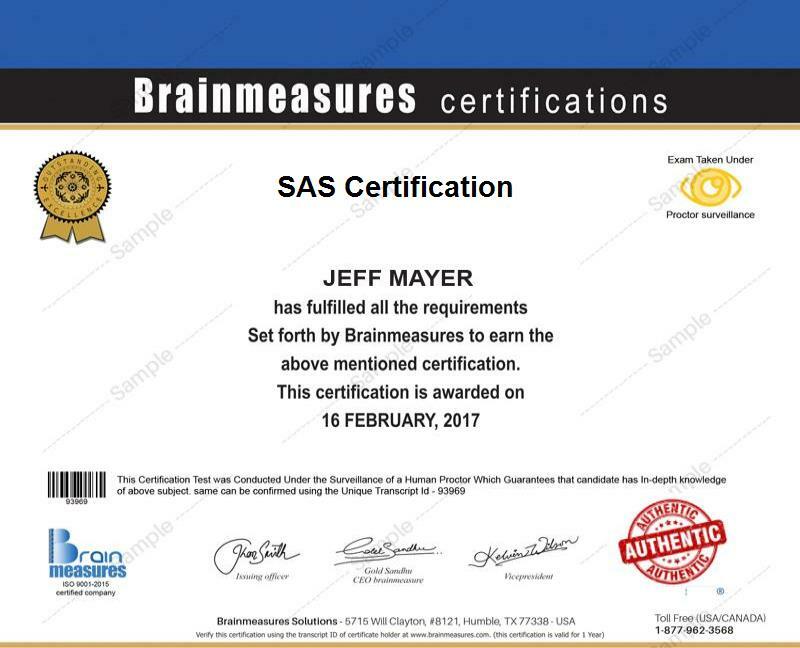 Before Brainmeasures will supply you with your certificate, you have to prepare yourself for the SAS certification exam which forms a huge part of the program. Passing the exam shows that you are already an expert when it comes to using SAS so you can expect Brainmeasures to finally give you your SAS certificate. The SAS certification program which you can now access at Brainmeasures targets anyone who wishes to gather information about the steps and procedures involved in writing SAS programs. It is also ideal for freshers, business and IT professionals and programmers who already know the basics of SAS but want to further improve their knowledge about the software. It is a huge help when it comes to advancing their career in the industry. SAS certification holders earn a decent sum of money. This means that you get the chance to improve your financial stability as soon as you start using your SAS certification to get highly profitable jobs. If you work as a SAS developer, then you can expect your annual earnings to go from $69,000 to $113,000. Working in an engineering position related to SAS allows you to earn an average annual salary of $112,000 while being a SAS solutions architect gives you the opportunity to receive an average annual salary of $121,000. If you hold managerial positions after completing your SAS certification course, then your annual salary can go from $120,000 to $181,000.